Early Saturday morning, the shortest Total Eclipse of the Moon / Total Lunar Eclipse in the 21st century will be visible, completely, in eastern Australia, eastern Siberia, the Pacific Islands, most of Japan, and most of Alaska. Most of the Western Hemisphere will see portions of the eclipse before the Moon sets, while most of Asia and Australia will see portions of the eclipse after the Moon rises. This eclipse will not be visible in Europe, Africa, and the vast majority of the Middle East. A Lunar Eclipse or Eclipse of the Moon is when the orbit of the Moon brings our natural satellite into the Earth's shadow, always near the time, and including the time, of a Full Moon. An Eclipse of the Moon or Lunar Eclipse is the type of eclipse that is safe to watch, directly, with the naked-eye, binoculars, or a telescope. Of course, visibility is dependent on local weather conditions. For areas where sky conditions are poor, as well as in areas where the eclipse will not be visible at all, Internet web-casts of the event will be available (links to these web-casts are listed near the end of this blog post). This will be the third Total Lunar Eclipse, in a Tetrad of four successive total eclipses of the Moon, within a span of two years, with no partial lunar eclipses occurring within those two years. The dates of the other three Total Lunar Eclipses of the current Tetrad are 2014 April 15, 2014 October 8, and 2015 September 28. Lunar Eclipse Tetrads are sporadic and usually rare. There were no such Tetrads during the 300-year period of 1600 to 1900. However, this is the first of eight Tetrads in the 21st Century! The next Tetrad will begin in April of 2032. 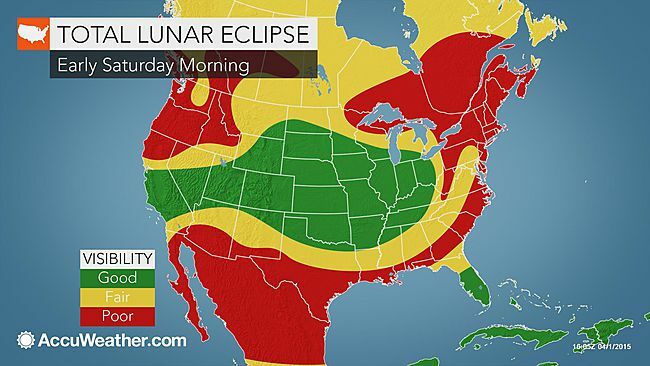 Unlike the Tetrad we are now experiencing, not all Lunar Eclipses are Total. Partial and Penumbral Lunar Eclipses also occur from time-to-time. However, all Total Lunar Eclipses include Partial and Penumbral phases of the Eclipse. Of course, "totality" or total phase of the eclipse is the most impressive part of the eclipse, what most people wait to see. The partial phase of the eclipse is when a piece of the Moon seems missing, as the Moon moves further into the Earth's main shadow known as the umbra, or as the eclipse is ending the Moon is further moving out of the Earth's umbra. The total phase of the April 4 eclipse, some call it the “Blood Moon” portion, will be the shortest of the 21st century. For less than five minutes, from 7:57:54 a.m. EDT / 11:57:54 UTC to 8:02:37 a.m. EDT / 12:02:37 UTC the Moon will be completely within the Earth's shadow. During this eclipse the Moon skims just inside the edge of the Earth's shadow, rather than passing through the middle of the shadow, as occurs during other Total Lunar Eclipses. This is the reason for this eclipse's brevity in the total phase. Often, particularly during the middle of a Total Eclipse of the Moon, the Moon will not disappear from view but can be seen with a reddish tint, what some call "blood red." If the Earth had no atmosphere, likely no sunlight would reach the Moon during a Total Lunar Eclipse, and the Moon might seem to disappear. Although no direct sunlight reaches the Moon during a Total Lunar Eclipse, the Earth's atmosphere refracts the sunlight around our planet allowing a portion of the sunlight to continue to be transmitted to the Moon. However, the refracted light reaching the Moon is primarily in the red portion of the light spectrum, as with red-tinted sunrises and sunsets (during such a Total Lunar Eclipse, a person standing on the side of the Moon facing Earth could see all Earth sunrises and sunsets simultaneously, as they viewed the Earth in a Total Solar Eclipse !). Hence, it is red light that is reflected from the Moon back into your eyes during a Total Lunar Eclipse. During the Total Lunar Eclipse, the Full Moon for April occurs at 8:06 a.m. Eastern Daylight Saving Time (EDT) / 12:06 Coordinated Universal Time (UTC). Native Americans knew the April Full Moon as the Pink Moon. This name came from the herb moss pink or wild ground phlox, one of the earliest wildflowers of Spring. In Earth's Northern Hemisphere, the April Full Moon is also known as the Sprouting Grass Moon, Seed Moon, Goose-Egg Moon, and the Egg Moon. Coastal Indian tribes called it the Fish Moon, as this was the time of year shad swam upstream to spawn. In the Southern Hemisphere, the April Full Moon is known as the Harvest Moon, Hunter's Moon, and Blood Moon. Want to receive SpaceWatchtower blog posts in your inbox ? Send request to < spacewatchtower@planetarium.cc >..